America’s energy policy has been the subject of much recent debate: From the Pope’s public advocacy of environmental stewardship to the EPA’s toughened regulations on pollution from petroleum refineries, the sources that power our society have rarely been so widely scrutinized. Once regarded as a subject best left to the energy sector, the way we fuel our economy has proven its relevance for all citizens, both in America and across the globe. For our team at Modernize, this subject seems particularly important. We’re dedicated to providing consumers information and opportunities related to one of clean energy’s most promising technologies: solar panels. Our primary interest is in helping individual readers to find environmentally friendly solar options that generate wallet-friendly savings in the long run. But we’re also paying attention to how whole swaths of the American energy landscape operate. That’s where our project “America’s Cleanest and Dirtiest Energy States” comes in. If you want to know your state’s energy track record or find out which states are leading (and trailing) the push for renewables, you’re going to want to read what comes next. Let’s get something straight: “Renewable” energy sources run the gamut from hydropower to wind, solar, and more. The EIA includes biofuels, such as ethanol, in this category as well. That means that virtually any state can tap into renewables, though some types are more readily utilized in certain natural environments (for instance, the Midwest makes good use of its wind). 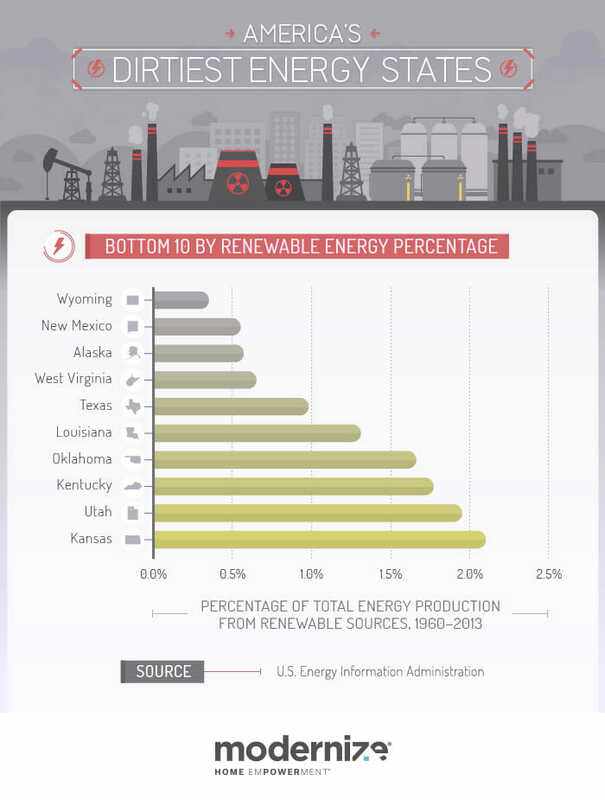 But that also means oil- and coal-rich states like Texas and West Virginia have historically focused their efforts on sourcing energy from “fossil” fuels, so their output from renewables is relatively paltry. Maybe Washington, California, and Oregon come as no surprise – we associate them with environmental concern and the geographical variety to embrace multiple renewable technologies simultaneously. 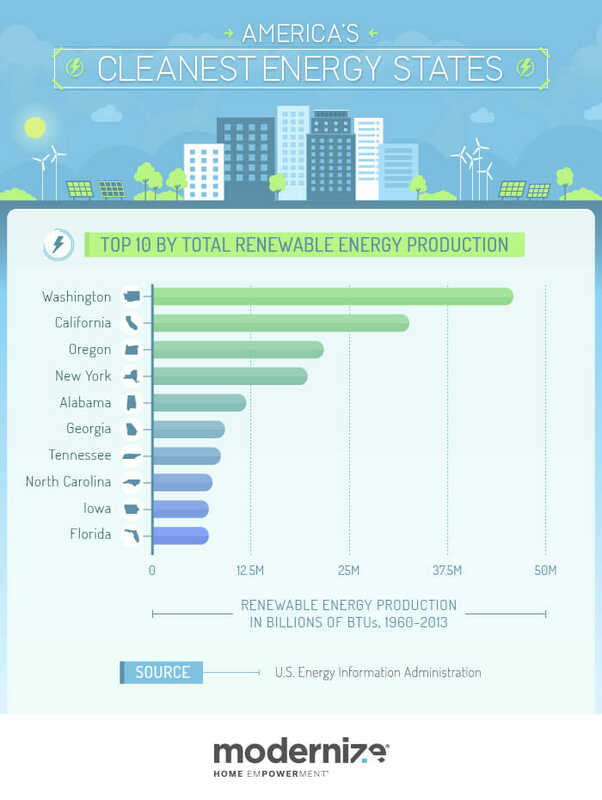 But the rest of the states that top the renewables ranking embody a striking mix of size, population, political preference, and socioeconomic standing. If this ranking indicates anything, it’s that success with renewables is possible in any combination of circumstances. 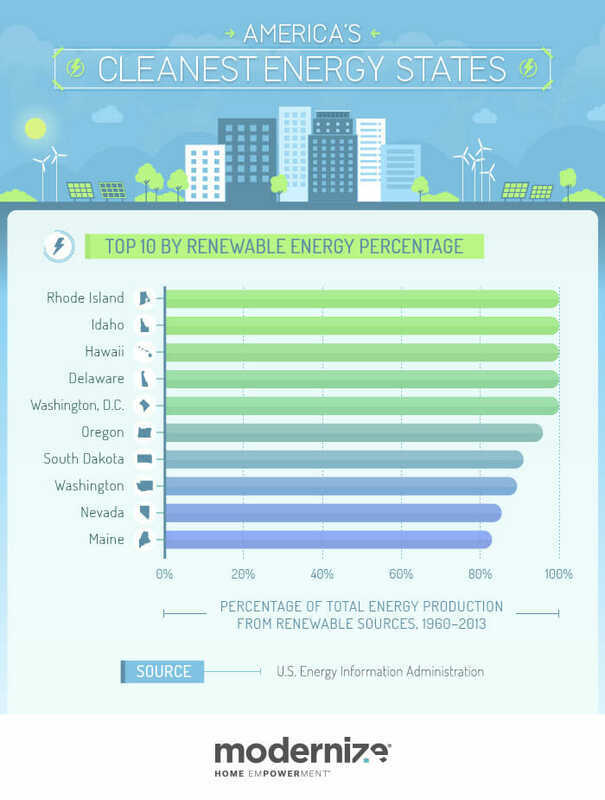 Yes, you read that right: Rhode Island, Idaho, Hawaii, Delaware, and D.C. produce virtually all of their energy from renewable sources. Sure, that might be different if these states had been dealt a different hand in the distribution of natural resources (no one’s begging to drill outside Newport), but we can appreciate their commitment to renewable energy all the same. After all, necessity is the mother of invention – and as time goes on, more and more states may find themselves in need. Then there’s the cohort above, all of whom derived less than 2.5% of all the energy they produce from renewable sources from 1960–2013. The difference in reliance on renewables couldn’t be starker: Wyoming’s renewable portfolio accounts for roughly one in every 250 BTUs (British Thermal Units – oddly, no longer commonly used in the U.K.) that the state produces. Many of the constituents of this dirtiest energy ranking are too rich in coal and oil to need much in the way of renewable alternatives – but that doesn’t mean they won’t adopt more sustainable technologies in the coming years. Predictably, Texas is at the top – but what about California or New York? 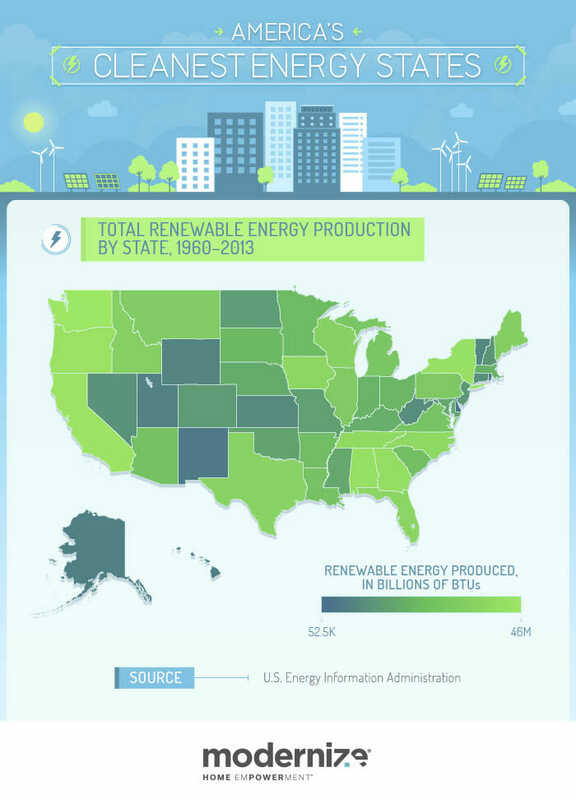 Why do states that ranked high in renewable energy production make the list? The answer is simple: Carbon dioxide emissions aren’t just a function of energy production. It’s no accident that the top-ranked states are almost all quite populous; the more people, the more energy they consume. That translates to emissions resulting from cars, heat, and other comforts modern Americans depend upon in daily life. 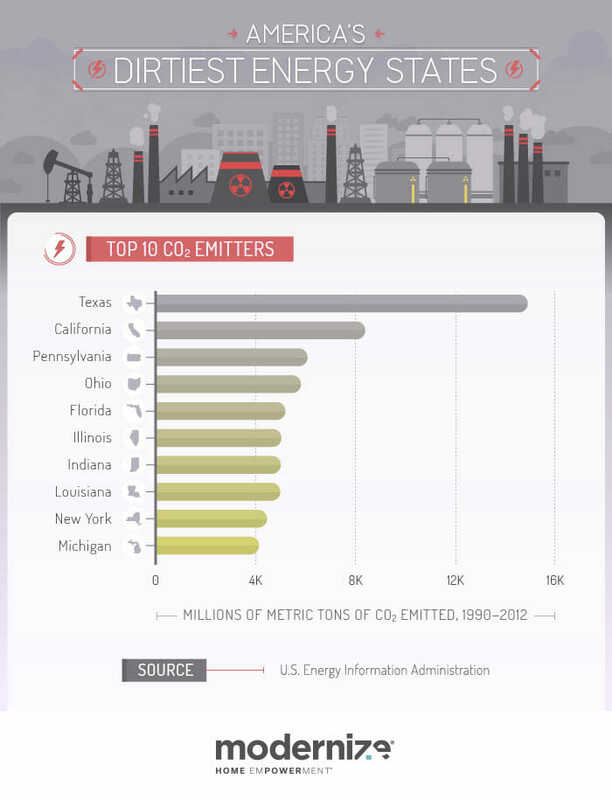 But don’t think emissions are an intransigent evil: Some states are making great strides. Let’s take a moment to commend these states for what they’ve accomplished in just 22 years. New York, Michigan, and Ohio are particularly exciting cases, demonstrating that even states closely associated with major industry can reduce emissions substantially. 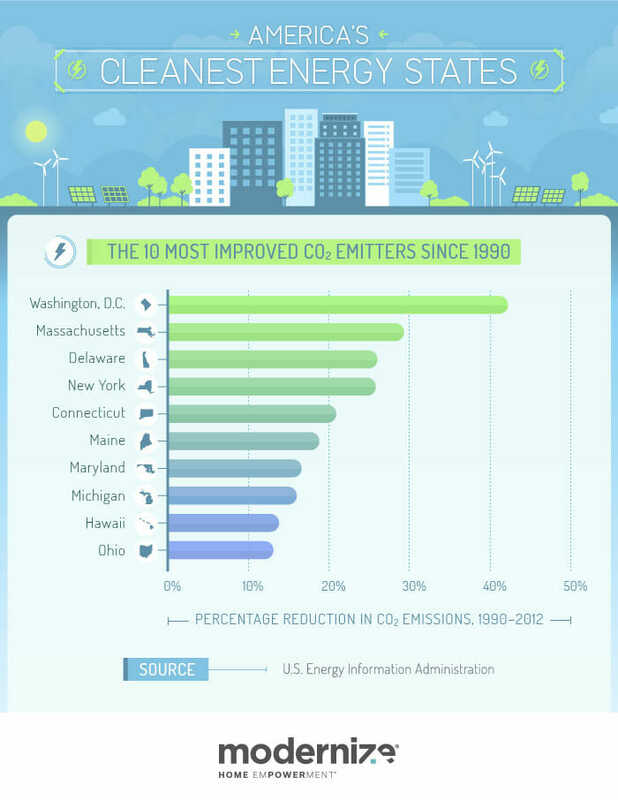 Additionally, some of the states that ranked high in the percentage of energy generated from renewables appear on this list, making it clear that improvement can always be a priority, whatever you accomplish for the environment. Speaking of improvement, let’s remember that your own home can contribute to the pursuit of new, clean technologies, no matter which state you live in. Whether it’s turning off the light when you walk out of a room or researching solar options that will also create savings, you can do a lot to promote a cleaner energy world. Who knows? If you and enough of your neighbors make the right choices, your state might just jump up on our cleanest states ranking!